Poll Results: 40% of IT professionals are not prepared for disasters and want to restore AD without having a backup. Not surprisingly, the majority of the respondents, like most administrators, have encountered the limitations of Windows’ native AD recovery options. The need for a reliable and robust tool to go beyond these limitations is apparent. 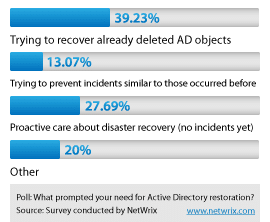 With the next highest percentage of responses pertaining to AD restore from a proactive position further serves to reveal the limitations of the native restoration features, options and capabilities and demand for a better method of recovering unwanted changes to AD. NetWrix Active Directory Object Restore Wizard allows for complete rebuilding of changed or deleted AD objects, including attribute level detail. The convenient wizard makes quick work of undoing any negative changes. How prepared are you for an Active Directory restore? Have there been occasions where it was necessary to manually add information not included during a restoration? Please share comments and experiences with an Active Directory restore below.